The renovation of a North London Property involved repurposing the existing floor plans in order to incorporate a large open kitchen and dining space. This included the installation of two Flushglaze fixed rooflights. The couple’s need for a rear extension was to create a minimal, contemporary space that would drive attention to the main focal point of the newly renovated property; a centralised bespoke bocci light. In order to create this unique space, Andrew Mulroy architects suggested rebuilding the current layout and starting from scratch; this would allow them to open up the entire rear section of the house. The extension includes a large kitchen area, dining space and lounge with additional seating areas overlooking the garden. It serves as a multi-purpose living space perfect for entertaining. In order to maximise the view of the garden area beyond the extension, the kitchen was placed to one side with an island segregating this from the rest of the space. The dining area was then positioned centrally with a lounge area behind and window seating to the side. This careful layout ensured that the different sections within the space were clearly defined and that the exterior views could be appreciated from all angles. With such a large space, the challenge here was to make the extension feel as homely as possible; the careful management of light throughout the project helped to achieve a balance of comfort and style. 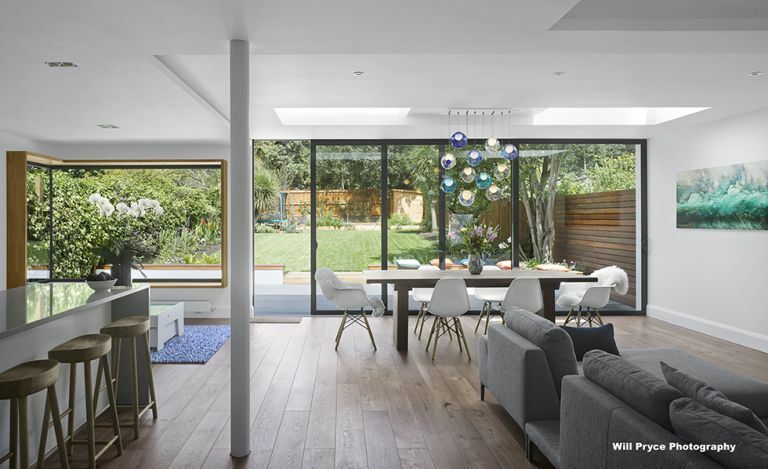 The large sliding glass doors and glazing above the window seat brings in a continuous stream of natural light, whilst ambient lighting combined with LED lights helps to both warm and dramatize different areas of the extension. Glazing Vision’s fixed Flushglaze rooflights were specified to contribute to this lighting scheme; two large panes of glass were installed side by side, with a solid section in the centre to suspend the bocci light fitting. The two rooflights, with their flush finish and minimal framework, help to illuminate the scheme by day, whilst the lighting feature at night creates colourful effects that reflect upon both sections of glass. The project has created an extension that exerts quirkiness and individuality; the client’s idea for a bold red finish to the outer frame of the sliding glass doors further accentuates the central lighting feature against the minimalist creams and whites. The new space beautifully reflects the client’s lifestyle and provides a space to be enjoyed.